GM2 gangliosidosis is a lysosomal disorder of recessive autosomal transmission, biochemically characterized by an inability to hydrolyze the GM2 ganglioside, which accumulates particularly in neuronal cells. The deficiency of the Hex A (ββ) and Hex B (ββ) isoenzymes produced by different mutations of the gene that codes for the β subunit is the cause for the GM2 gangliosidosis 0 variant, known as Sandhoff's disease. In turn, a deficiency of the Hex A isoenzyme, produced by different mutations of the gene that codes for the β subunit, known as Tay-Sachs disease More Details, involves two variants of different enzymological types. These are the B variant, with a lack of the Hex A isoenzyme, and the B1 variant, with the presence of a mutated Hex A isoenzyme, catalytically inactive against the negatively charged substrates such as the GM2 ganglioside and 4-methylumbelliferyl-N-acetyl-β-D-glucosamine-6-sulfate (4-MUGS), but active with the neutral substrates (β-hexosaminides). The magnetic resonance imaging (MRI) findings in GM2 gangliosidosis variant B1 have been described in only one article reported by Grosso et al. However, the proton MR spectroscopy findings are still not known. We herein, describe the cranial computed tomography (CT)/MRI and single-voxel proton MR spectroscopy, in a case with GM2 gangliosidosis variant B1, presenting in an infantile form. 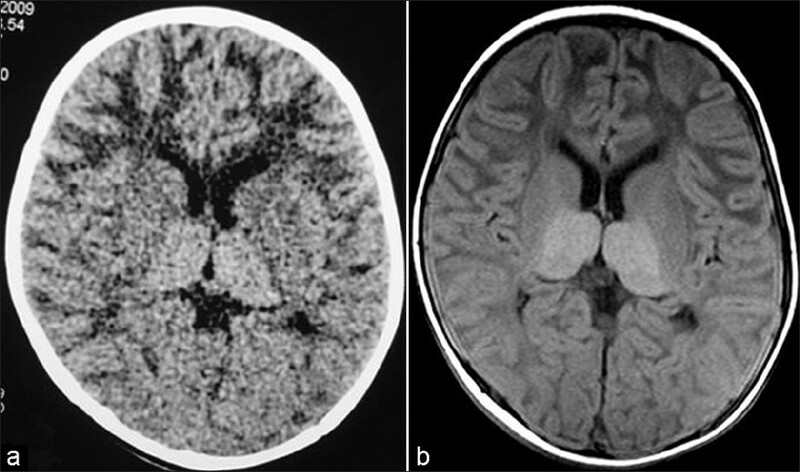 An 18-month-old-boy, born to non-consanguineous Indian parents, presented with refractory seizures and progressive neuromotor deterioration in the form of loss of acquired milestones and generalized hypotonia, which was progressively replaced by spastic quadriparesis. Gradually, the child became unresponsive to the surroundings and developed hyperacusis and severe visual impairment. His birth weight and head circumference were in normal range. 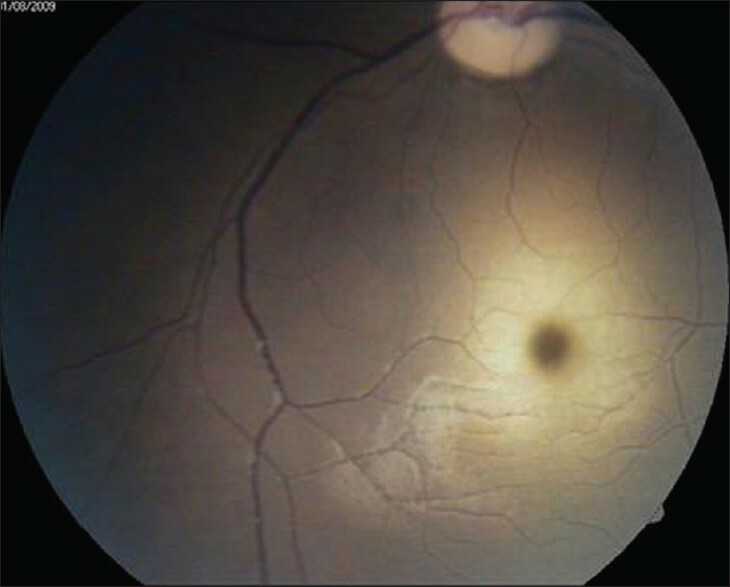 Fundoscopy demonstrated bilateral cherry-red spots in the macular area [Figure 1]. 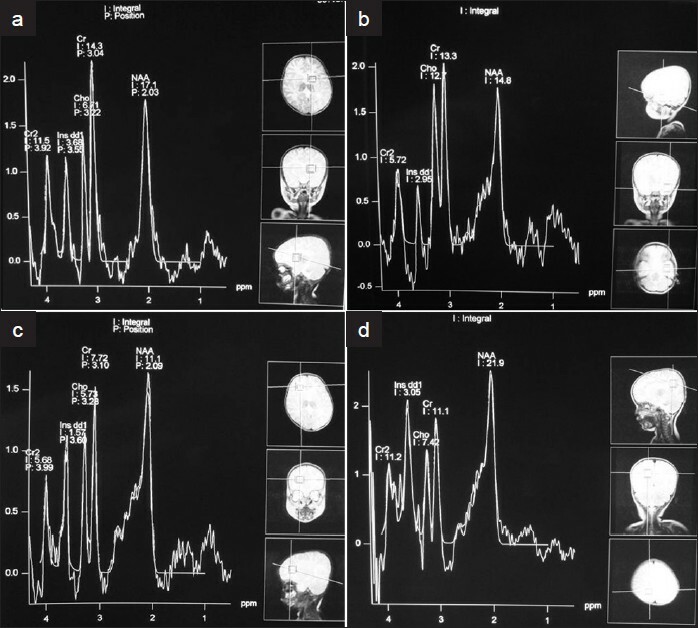 A drug-induced electroencephalogram (EEG) showed generalized epileptiform discharge and abnormal sharp slow-wave activity in the delta range. An electrophysiological study revealed severe motor and sensory neuropathy involving the lower and upper limbs. A visual evoked potential (VEP) study suggested bilateral visual pathway dysfunction (right > left). Serum amino acids and urine organic acids as well as the metabolic panel were normal. Brain imaging done at 18 months of age revealed diffuse, symmetrical hypodensity/hypointensity in the bilateral supratentorial white matter, with relative hyperdense/hyperintense thalami on noncontrast CT (NCCT)/T1-weighted MRI [Figure 2]. In addition, mild diffuse cortical atrophy, gyriform mesial temporal lobe cortical hyperintensity, and marked thinning of the corpus callosum were also noted. However, the infratentorial structures appeared normal [Figure 3]. White matter involvement was more extensive and pronounced on T2-weighted images [Figure 4], and was evident as increased signal intensity in the periventricular, deep, and subcortical white matter, corpus striatum, internal/external capsules, and in the medullary laminae (internal, medial, and lateral). Furthermore, hypointense ventral thalami and hyperintense posteromedial thalami on T2WI, enlarged and swollen bilateral caudate/lentiform nuclei, and multiple punctate T2 hypointensities within hyperintense putamina (speckled appearance) were also seen. No blooming was evident on the T2* gradient echo sequence (not shown). Post gadolinium T1W images [Figure 5] revealed no abnormal contrast uptake. On proton MR spectroscopy [Figure 6], the integral values of the metabolite peaks and their ratios were acquired from eight regions of interest (ROI) - the right/left basal ganglia, bilateral frontal, temporal, and parietal lobes, using the single voxel stimulated echo acquisition mode (STEAM) technique (TE=30 msec). The proton spectra revealed decreased N-acetyl aspartate (NAA)/creatinine (Cr) ratio, increased myoinositol (mI)/Cr ratio and normal choline (Cho)/Cr ratios in most of the tested regions, as compared to that of the age-matched control subjects. 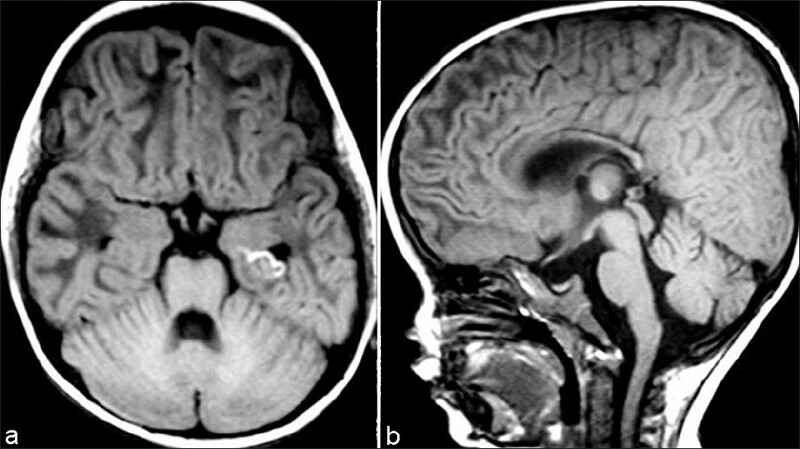 Clinical and cranial MRI findings were highly suggestive of GM2 gangliosidosis. Molecular analysis confirmed the diagnosis of GM2 gangliosidosis and categorized it as Tay- Sachs variant B1, by demonstrating Hex A deficiency on the biochemical analysis of leukocytes and skin fibroblasts using the fluorogenic substrates 4-methylumbelliferyl-N-acetyl-β-D-glucosamine-6-sulfate (4-MUGS) and gel electrophoresis. HexA activity tested with 4-MUGS was 9.8 nmol/mg per hour in leukocytes (normal range=128 - 327) and 15.7 nmol/mg per hour in fibroblasts (normal range=378 - 956). Tay-Sachs disease is due to deficiency of the Hex A isoenzyme, produced by different mutations of the gene that codes the α subunit. It involves two variants of different enzymological types. These are the B variant, with a lack of the Hex A isoenzyme; and the B1 variant, with the presence of a mutated Hex A isoenzyme, catalytically inactive against GM2 ganglioside and 4-MUGS, but active with neutral substrates (β-hexosaminides). There are few studies of the B1 variant, with 45 bibliographical references in Medline, for the period from 1984 to 2003. The disease has a high incidence in the Portuguese population (prevalence ~0.84/100,000 live births) and has also been described in families of Portuguese origin residing in other countries. To our knowledge, this is the first documented case of B1 variant of GM2 gangliosidosis born to an Indian couple, who were not of Portuguese origin. The MRI findings in GM2 gangliosidosis variant B1 have been described in only one article reported by Grosso et al. However, the proton MR spectroscopy findings are still not known. The MRI studies of patients with GM2 gangliosidosis variant B1 do not differ from those with the Tay-Sachs-variant B and Sandhoff diseases, and they reflect the pathological findings of neuronal cytoplasmic distention, demyelination, and gliosis involving the white matter. However, the process of white-matter demyelination seems to be more rapid and extensive in GM2 gangliosidosis-variant B1, involving the internal, medial, and lateral medullary laminae as seen in our case and reported by Grosso et al. Both in the Tay-Sachs (variants B and B1) and Sandhoff diseases, the thalami demonstrates symmetrical hyperdensity on CT, and hyper/hypo-signal intensity on T1/T2-weighted MR images, respectively. These density/intensity changes in the thalami and mesial temporal lobe gyri probably reflect the accumulation of calcium and GM2 ganglioside. 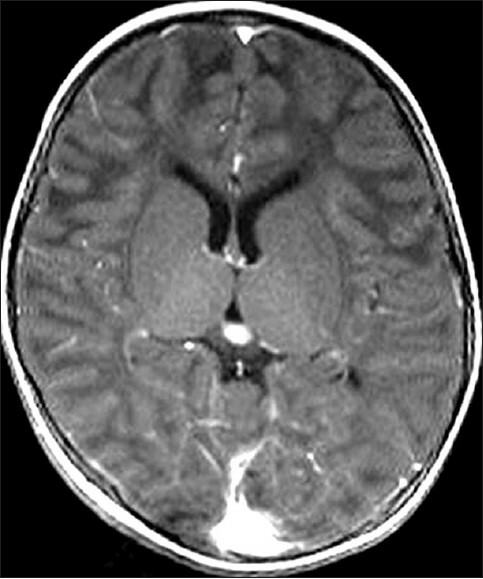 Mild brain and corpus callosum atrophy in these patients has invariably been attributed to disturbed myelination. The MR spectroscopy findings in our patients are non-specific and indicate progressive neuronal loss and gliosis in the cerebral tissue. Evaluation of the data available in the literature enables us to detect similar MR spectroscopy findings in both Tay-Sachs-variant B  and Sandhoff  diseases. 1. Gravel RA, Kabach MM, Proia RL, Sandhoff K, Suzuki K, Suzuki K. The GM2 gangliosidoses. In: Scriver CR, Beaudet AL, Sly WS, Valle D, editors. The Metabolic and Molecular Bases of Inherited Diseases. New York: McGraw-Hill; 2001. p. 3827-76. 2. Tanaka A, Ohno K, Suzuki K. GM2 gangliosidosis B1 variant: A wide geographic and ethnic distribution of specific â-hexosaminidase á chain mutation originally identified in a puorto Rico patient. Biochem Biophys Res Commun 1988;156:1015-9. 3. Grosso S, Farnetani MA, Berardi R, Margollicci M, Balestri P. GM2 gangliosidosis variant B1-neuroradiological findings. J Neurol 2003;250:17-21. 4. Assadi M, Baseman S, Janson C, Wang DJ, Bilaniuk L, Leone P. Serial 1H-MRS in GM2 gangliosidoses. Eur J Pediatr 2008;167:347-52. 5. Wilken B, Dechent P, Hanefeld F, Frahm J. Proton MRS of a child with Sandhoff disease reveals elevated brain hexosamine. Eur J Paediatr Neurol 2008;2:56-60. 6. Heinz RE, Provenzale JM. Imaging findings in neonatal hypoxia: A practical review. AJR Am J Roentgenol 2009;192:41-7. 7. Vanhanen SL, Raininko R, Santavuori P. Early differential diagnosis of infantile neuronal ceroid lipofuscinosis, Rett syndrome, and Krabbe disease by CT and MR. AJNR Am J Neuroradiol 1994;15:1443-53. 8. 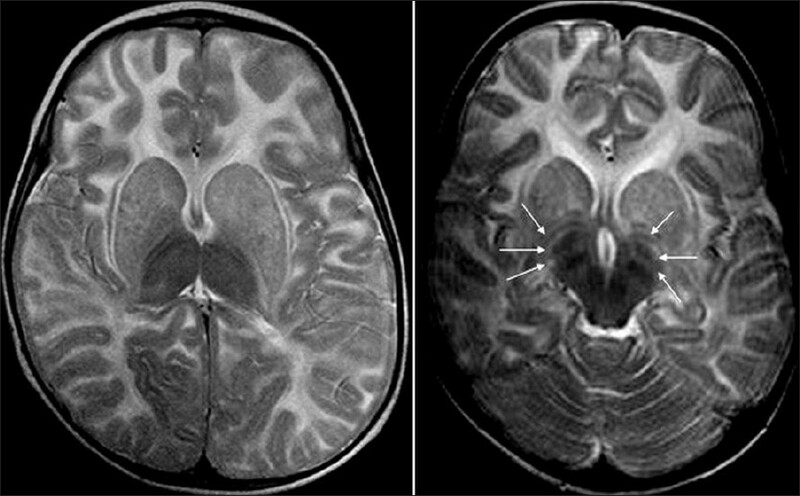 Sasaki M, Sakuragawa N, Takashima S, Hanaoka S, Arima M. MRI and CT findings in Krabbe disease. Pediatr Neurol 1991;7:283-8.